With the knowledge of leadership experience gained in several agencies - good and bad - I've used my "gift" (see #7) of keen observation and analysis to formulate some truths that are common threads. See if any of my truths ring true to you, and add any you've discovered in the comments field below. 1. No deed goes unpunished - Unfortunately, this negative truth can often mean the most diligent, hard working officers get more than their share of the workload. 2. It is never so bad it can't get worse - Another potential negative, but a turn for the worst must be planned for, especially during critical incidents (a la Murphy's Law). Plan for the worst and then plan for it to get still worse. 3. You can learn more from bad leaders than you learn from good ones - Sometimes it is difficult to define what makes a good leader "good." But it is usually very easy to define what makes a bad boss "bad." 4. You can either DO the right thing or BE the right thing - Colonial John Boyd (of the OODA loop) used to deliver this "Do or Be" leadership speech: "You can say and do the right things, to the right people, at the right times, and progress up the ladder and BE. Or you can DO what is right and make a real difference. It may cost you a promotion or even career. It's a decision we all have to make throughout our lives and careers: To DO or to BE." 5. Integrity is it's own reward - Telling the truth and doing the right thing, even when doing so could cause you problems, will not endear you to the upper management of some agencies (see #4). So, integrity sometimes becomes an internal reward, a personal choice of how to live your life. 6. No man is a prophet in his own land - Whether due to jealousy of their expertise or simply ignorance of their talents, top performers may get brushed aside in their own organization. 7. God gives each of us gifts but no user's manual - The trick is to figure out your gifts and how to use them. As a leader, identify the gifts of your team members and try to put them into positions suited to their unique talents. ( I understand what he means about no user's manual as such, but God has given us a user's manual called the Bible). 9. Cops rarely invent a bad attitude - Many cops develop bad attitudes for either a period of time or a whole career, Why? Generally, because someone may have wrong them - someone gave them the ingredients for a bad attitude. As a leader, try not to give someone a bad attitude, and help the members of your team work through those they inevitable develop. 10. You can judge a leader by the enemies they keep, rather than their friends - In ancient times the great room in a castle was decorated with standards of both the King's enemies and allies - they were both held in high regard. Over the years I have come to be proud of the men I call enemies, because man would want to be counted among their friends. Posted on November 19, 2015 by Bob & Jane Keller and filed under Resources and tagged leadership. We are always trying to sharpen our skills in reaching out to help people in crisis, recently we did just that by taking a class on Crisis Intervention. Below you will see our certificates. Posted on November 19, 2015 by Bob & Jane Keller and filed under Resources and tagged certificate crisis intervention. Posted on November 19, 2015 by Bob & Jane Keller and filed under Resources and tagged newsletter. Posted on November 19, 2015 by Bob & Jane Keller and filed under Resources and tagged prayer. Posted on October 24, 2015 by Bob & Jane Keller and filed under Blog Updates, Resources and tagged funeral. 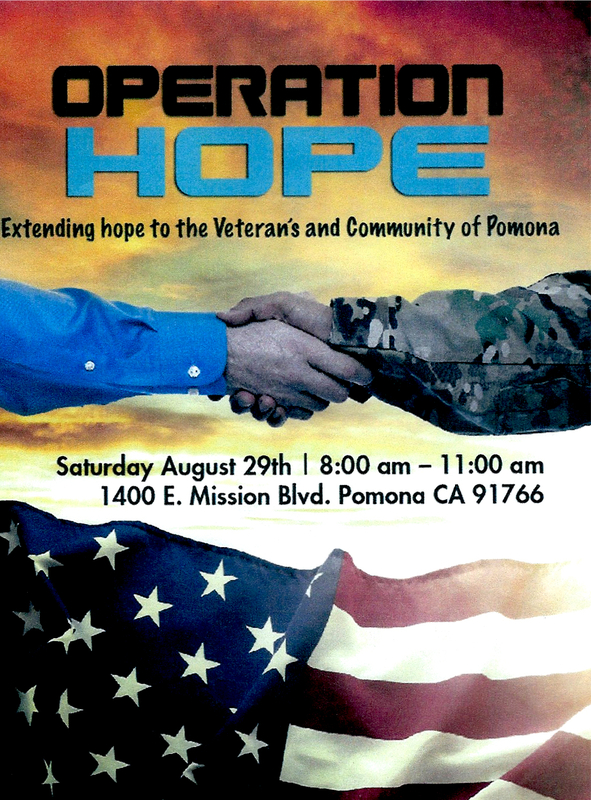 Please be advised that the time for this event is 3:30 P.M.
Posted on August 18, 2015 by Bob & Jane Keller and filed under Blog Updates, Prayer Requests, Resources and tagged operation hope veterans. Area D Meeting at the Pomona Council Chambers TBA! Due to unforeseen circumstances the Area D meeting had to be cancelled. It will be rescheduled in the next coming months. There will be an Area D Meeting in Pomona for Chaplains, Law Enforcement & First Responders TBA at the Council Chambers, 505 South Garey. Refreshments will be serve. We have seating enough for 75 people. Please RSVP! 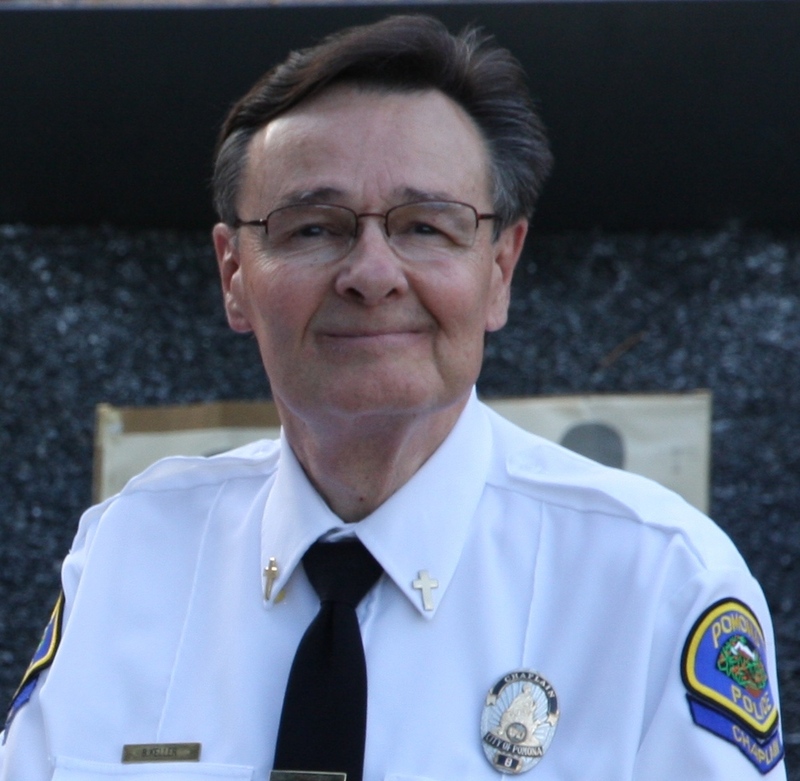 Our speaker will be Chaplain Mike Macintosh who has a deep commitment to the law-enforcement and first-responder communities, Mike serves as a Chaplain for the San Diego Police Department, the Newport Beach Police Department, and the American Red Cross. As a certified trainer through the International Critical Incident Stress Foundation, Mike has facilitated many critical incident stress management debriefings, and has provided training to first responders across the US and in Mexico. Mike also serves as a committee member for the California Commission on Peace Officer’s Standards and Training (POST). He will speaking primarily on post-9/11 rescue efforts in New York City and the Sandy Hook shooting. He was dispatched to both incidents. Mike holds Master of Arts, Master of Religion, Master of Divinity, and Doctor of Divinity degrees from Azusa Pacific Graduate School of Theology, and a Doctor of Ministry degree from Fuller Theological Seminary. He is an adjunct professor at Azusa Pacific University, and the author of several books, including When Your World Falls Apart, drawn from his experiences as a Chaplain responding to the New York World Trade Center disaster. 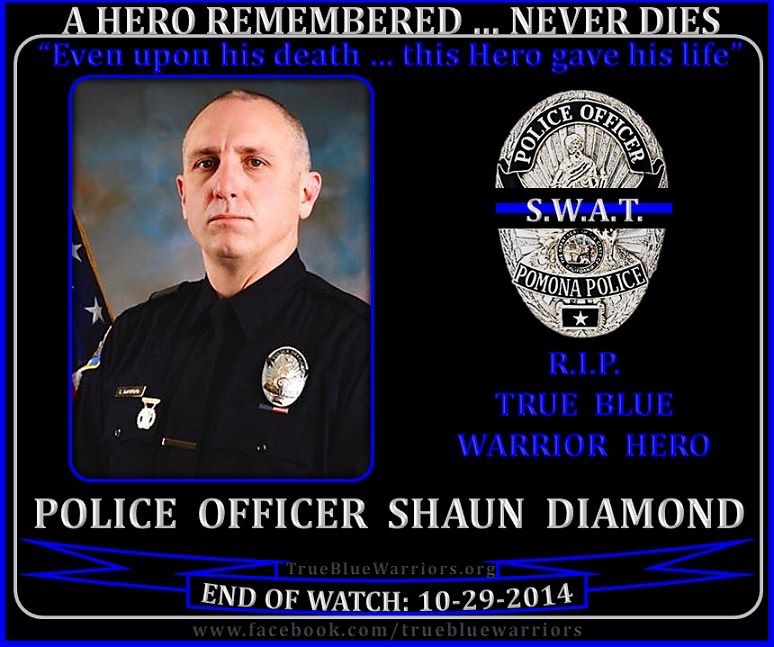 Posted on May 15, 2015 by Bob & Jane Keller and filed under Blog Updates, Prayer Requests, Resources and tagged area D.
Officer Shaun Richard Diamond had been a police officer for 16 years and began serving the Pomona community in 2006. Shaun had a passion for working SWAT and served as a member of the Pomona SWAT Team for the past 6 years. He served as a Field Training Officer and was assigned to the Pomona Downtown District where he worked as a law enforcement Liaison with the local businesses and the community. Shaun contributed greatly to numerous community events such as the Special Olympics and Tip-A-Cop, including K-9 and SWAT demonstrations for numerous local school children. Shaun really enjoyed working with children and loved to tell them about his job while showing them all of the SWAT equipment that the team used. Shaun Richard Diamond was a model Law Enforcement professional and was truly a wonderful human being with an incredible sense of humor and a beautiful contagious smile. 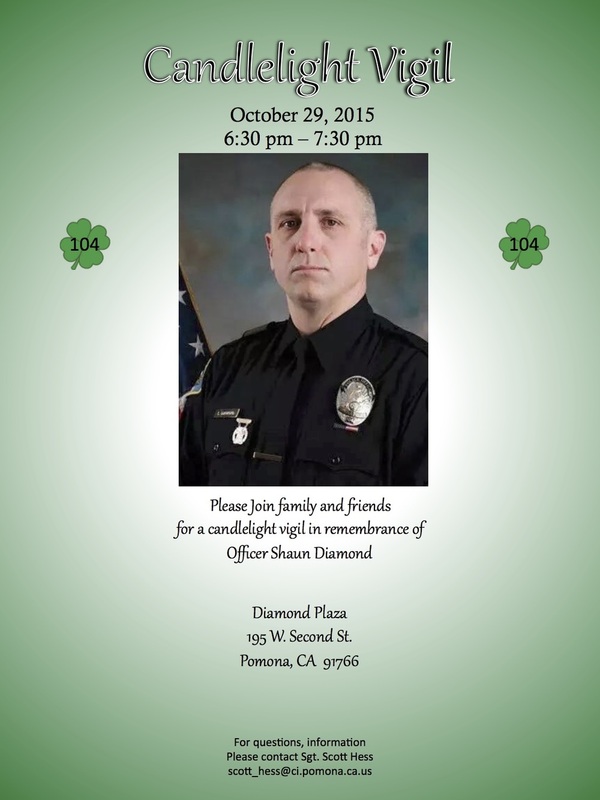 Shaun will be forever missed by his Pomona PD Family. Posted on November 3, 2014 by Bob & Jane Keller and filed under Blog Updates, Prayer Requests, Resources and tagged funeral Shaun Diamond. We have completed radio training and we are patrolling the streets of Pomona to provide the officers any assistance with victims or family members. This will include suicides and homicides. We will still continue to go on ride-alongs and visit the Station. Last June we celebrated our 10th year anniversary with the Pomona Police Department. PTL. Several months ago Jane was given a reward which enables her to wear the Chaplain uniform of the Pomona Police Department. This reward was given to her for her prior years of service with me. Jane and I work as a team as we are always together on calls, etc. at the Police Department. We recently installed a new Chaplain, Rex Wolins, for the Pomona Police Department. He served 15 years as a reserve officer and Chaplain at the Los Angeles County Sheriff Office. He is already a great asset to our chaplain program. We are out on DUI checkpoint for the Pomona Police department every month to assist the officers and to offer the "Ministry of Presence." Recently we attended another graduation at the Orange County Regional Training Academy in Tustin, CA. 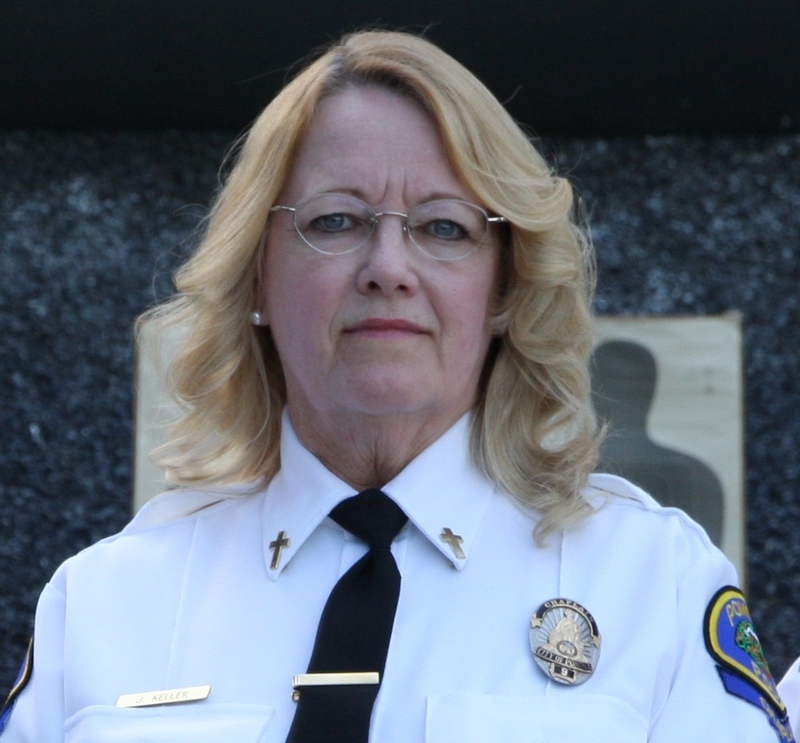 Brenda Sutherland just retired after serving Pomona Police Department for 31 years. We all gave her what we call the “Walk of Honor". The name "In Pursuit Ministries of California" is now protected and we are a 501 (c) 3 non-profit ministry. We recently upgraded our presentation for the ministry, which is pre-recorded with a who new format. Once completed, we will upload it into our website. We let you know when it is completed. In October, we presented our ministry in two churches: Continental Baptist Church in Marana, AZ, Mike Gradwell is the pastor, and Cornerstone Baptist in Sahuarita, AZ, John Leonard is the pastor. (Great meetings and great fellowship abounded.) While in Marana we were able to speak to four officers. We learned they do not have a Chaplain Program and would like to start one. There may be one person qualified to become their Chaplain from Continental Baptist Church. Pray that opportunity will open. We scheduled a training seminar on "Death Notifications for Police Officers and active Chaplain. We have learned recently that police officers do not receive tis type of training in the Academy. We did not have enough sigh-ups and had to cancel the class. We are rescheduling the Seminar for June of 2014. Please pray for a good turn out. I was invited to give an invocation for the "Salute to the Military" event in El Segundo, CA. Represented the Commander and the First Sargent, who were unable to attend due to the government shut down. This gave me an opportunity to represent MEPS to the city leaders of El Segundo, CA. where MEPS is located. We continue to visit the MEPS at least once a week to minister to the staff, recruits and their families. Many times we get a share the Gospel. We ordered business cards printed with Psalm 91 to pass out to recruits and parents. As opportunities permit we pass out copies of the Bible also. Recently one of our men at the MEPS retired from the Army and I was asked to give the Invocation! To the best of our knowledge, out of the 65 MEPS throughout the United States, only two MEPS have volunteer civilian chaplains. One is in Fargo, ND and the one in Los Angeles. Our MEPS is the flagship of the 65 MEPS in the US. Over 9,000 recruits ship out of our MEPS each year into the Military. We consider this an honor for us to serve. Pray this door will continue to stay open! We continue to ride with the California Highway Patrol and minister to them. Recently I was asked to give an invocation at the promotional luncheon for Captain Dan Minor, who has been promoted to Assistant Chief and is relocating to Fresno, CA. Captain Minor opened the opportunity for us to become Chaplains with the CHP. The CHP does not have an organized Chaplaincy Program. As far as we know, we are the only Chaplains who ride with the CHP in the entire state of California. We have a new Captain and pray that he will continue to allow us to be a part of the Santa Fe Springs CHP. Pray this door will remain open. We have ridden with the Santa Ana Station and are also seeking the opportunity to ride with the Westminster Station. I gave the invocation at the Southern California Association Fingerprint Officers in Garden Grove CA. This was a great honor for me. Our Chief Dave Keetle was also there to give a class. We attended the funeral for Officer Jon S. Coutchie of the Laguna Beach Police Department. On the evening of Joh's death he was traveling northbound on Pacific Coast Highway in an attempt to locate a vehicle that being driven recklessly. 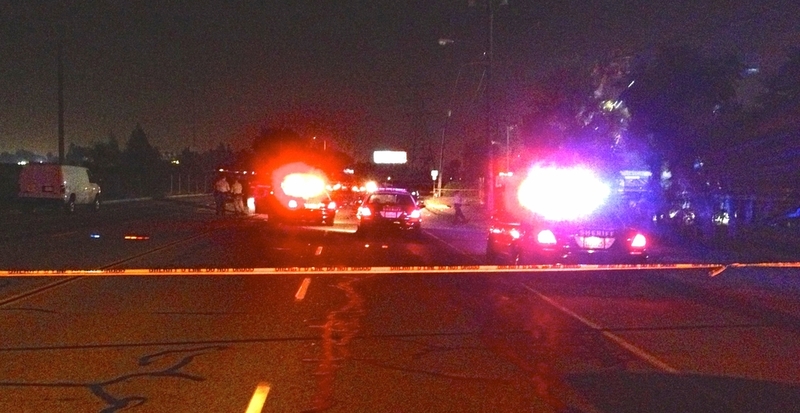 While looking for the speeding vehicle, Joh was involved in the traffic collision that ended his life. End of Watch: September 21, 2013. The finances we receive from various churches and individual is not enough for us do everything we need to do, but we are thankful for the support we do received. Here is a list of the churches who support us. Westview Baptist Church, North Charleston, SC. In closing we want to thank you all for your prayer and financial support. Posted on November 1, 2014 by Bob & Jane Keller and filed under Resources and tagged newsletter. One night in early May, Jane and I were out on a routine ride along. Before each ride along we attend the briefing before the officers are dispatched to there assigned beats. After the briefing we began our ride along and I stated to the Officer that I wanted to ride, until about midnight and that I needed to get home early that night. He said that would be fine. Each ride along is always a pleasure to ride with the officers and this ride along was no different. We had a number of different calls throughout the night, nothing out of the ordinary. Jane was also out that night riding with a different Officer. The evening was calm and quiet and nothing much going on in the city. Frankly, I like quiet nights because it gives me a chance to talk with the officer with no interruptions as we patrol the beat. About midnight he drove me back to the station. figured the night was ending, and that Jane and I would meet up and go home. After we reached the Stationwe were almost immediately dispatched to a situation where 4 deceased bodies were found in a house. 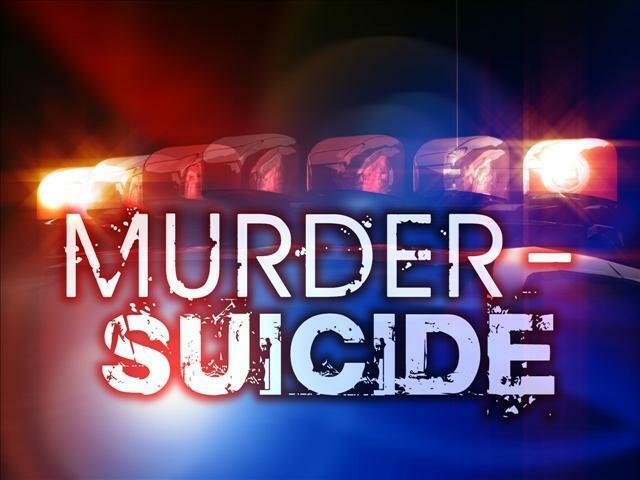 When we arrived at the scene we learned there were three murdered people with a fourth body who had committed sucide. Oh my! 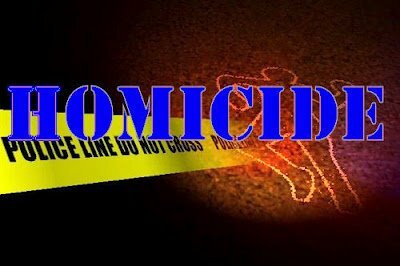 As the Officer and I approached the house to go inside, the Corporal on the scene asked me to talk with the family, as I was needed there. He kept me from going inside the house. I am so thankful for that and later I told him so. I sure don’t need that memory. The Corporal pointed me to two family members on the outside perimeter. On my way to the family, I spoke with a Sergeant and a Patrol Officer that gave me a quick debriefing of what happened. The Sergeant asked if I would tell the family members that there were four deceased people in the house. I did hesitate somewhat, feeling the gravity of the situation, but knew my job was to give the death notices and comfort the family. In the back of my mind I was praying, I hope Jane is on her way, I need her to help me with this. Matthew 18:20 states, “For where two or three are gathered together in my name, there am I in the midst of them.” That verse came to mind that night. As I approached the family, I quickly ask the Lord to give me the right words to say. The family’s response was overwhelming as I stood there trying to comfort them. Just after I shared this tragic news, I saw Jane walking up the sidewalk with the Officer she was riding with. Wow! I was so happy to see her. In the eleven years we have done this, she is not only my partner in life, but also my partner as a chaplain’s wife. I’ve said it many times that I could not do what I do without her by my side. I am so thankful for her! We stayed with the family for almost 3 hours trying to comfort them in the most tragic time of their life. Psalms 37:23 states, “The steps of a good man are ordered by the Lord: and he delighteth in his way.” Our steps were certainly ordered y the Lord that night. Praise the Lord we could be there to assist the Officers as well as the family members. We did finally make it home that night and got to bed about 5 AM. A few days later I received a call from one of the family members asking us to tell their children of deaths of their loved ones. The following Saturday we visited the family and learned that the children were already told of the news. There were about 30 family members and friends. By God’s grace, we tried to comfort them and pray for them. Later, the family requested that we attend the viewing. It was very sobering to see three caskets in the front of the room. This was a tragic situation, but I am glad we could be there. 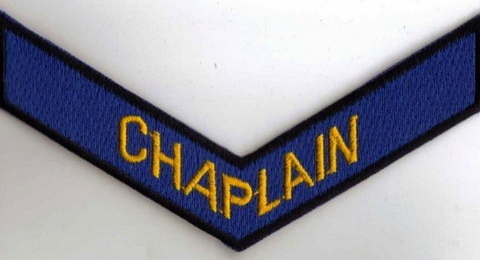 I often say that chaplains have the opportunity to go places where a pastor could not go. The next day on Sunday night after church, we had stopped at our local market to pick up some groceries. On our way home, we were sitting in the left turn lane waiting for the light to change when we heard a bang sound to our right. We saw a vehicle coming with sparks flying out from under it, out of control, about 10 feet in front of us, moving to our left. It then hit a 3 foot flower planter at the gas station, went airborne about 15 feet hitting the awning of the gas station, then dropped onto 2 gas pumps, knocking them off their foundations. The vehice rolled and landed where you see in the photo. We were watching this as it was happening. I thought we were watching a Hollywood movie! I quickly drove our vehicle over to the gasoline station and parked and ran into the station and told the attendant to turn off the pumps. Jane called 911 while I proceeded to see if I could offer any assistance to the people inside the vehicle. There was no response from the occupant of the vehicle. We waited for the first responders and the police. They ere there within minutes! I was asked to give my statement as a witness to what I saw happen to the police officer. He asked me what my occupation is and I stated I ama police chaplain, the Officer was delighted and I gave hi my card. We learned later that there was only one person in the vehicle. They were able to get him out and rushed him to the hospital and that he was going to be okay. What a blessing for us to be chaplains and have the opportunity to help people when they need it the most. We are excited about introducing our new 7 minute video about In Pursuit Ministries of California and would love for you to watch it. Please take time to watch it! During the month of June we attended our annual FBFI endorser agency’s training held at Faith Baptist Church, Taylors, SC where I was ordained and served on staff many years. It was great to be back. During this time saw many of our chaplains and received some very intense training. During the meetings Dr. John Vaughn showed the video to all of the chaplains as well as the Board of the FBFI. Many of the those who saw it said it was an excellent video. ! Many of you know, we have family that lives in South Carolina. While we attended the FBFI Annual Fellowship meetings mentioned above we had the joy of seeing our children. We met with our daughter, Charmaine, and her two children, our grandchildren, our son Nathan and his wife Rochelle and their new 6 month old, our new granddaughter, Isabel, As you can see in the photos, she is beautiful! It was great to seeour family again after almost 4 years.! ! While we were there we stayed at the Barnabas House mission house owned by Rod & Linda Hochmuth, Nathan’s in laws. We thank you Rod and Linda for inviting us to stay. What a blessing! ! 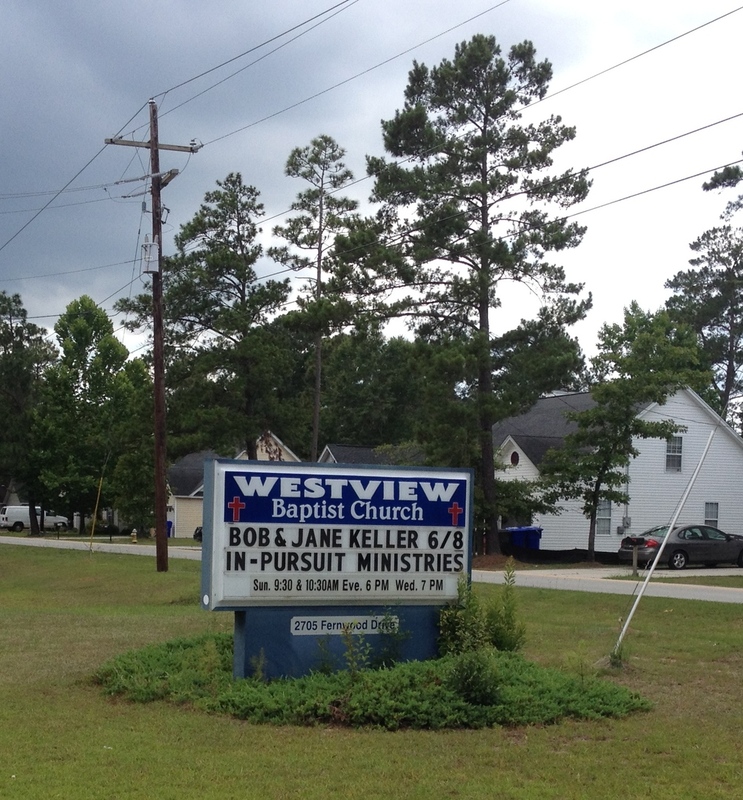 We were also invited to speak at the Westview Baptist Church in North Charleston. Westview Baptist has been supporting us now for over 6 years. Pastor Howell and his wife Mary as well as the church treated us like we were Kings from a far away place. Pastor gave me the whole Sunday to preach and give an update on our ministry including the chance to share our 7 minute video. I hope you will take the time to watch it! They gave us a wonderful love offering to help with our expenses for the trip. We have not served at the MEPS, Military Entrance Processing Station in El Segundo since last Fall. We have asked many of you to pray that they might invite us back. When we were in South Carolina I received a call inviting me to perform the invocation for the Change of Command Ceremony on June 25, 2014. While we were there we did ask would it be possible to come back on a regular basis? They stated, they will check into it. They certainly would love to have us back and said many times how much they missed us. Please pray we will be able to return. 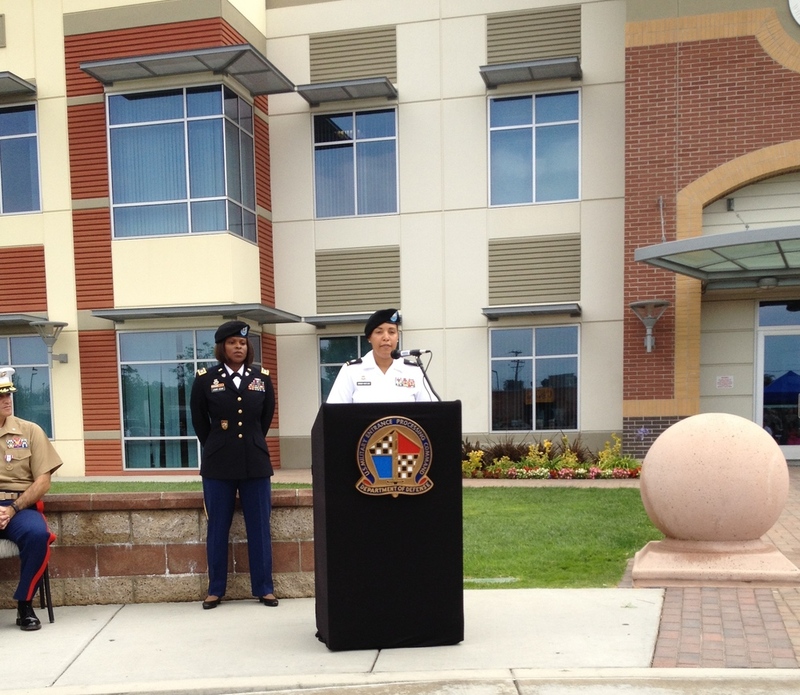 Our new commander is Lt. Col. Robin Branch-Hoeflein, US Army. Obviously we got to meet her and she is a delightful person. Our former commander is Lt. Col Matthew J. McDivitt, US Marine Corp. We will miss him! His new duty station will be Paris Island, SC. Last June we have served as volunteer Chaplains for 11 years at the Police Department. We praise the Lord for the opportunity to serve! Hope you enjoyed reading this newsletter and please take 7 minutes to watch our new video and don’t forget to pray for us! Thank you!!
. Perhaps we can show it in Sunday School or an evening service.! ! Posted on August 10, 2014 by Bob & Jane Keller and filed under Blog Updates, Resources and tagged newsletter.